Each year, my French health insurance allows a free pair of prescription glasses. And by early January, I can be found hovering in the boutique of E.B. Meyrowitz – the legendary opticians – drooling over their line of sunglasses and yet another version of their "Manhattan" frames. At present, I own seven pairs of the latter and that’s not counting the two that I left behind in taxis. Assembled, my line-up includes ruby red, royal blue, pale yellow and four different hues of tortoise shell. Certain colours flatter my eyes and jawline more than others. Little matter, I am devoted to them all and feel as proud of my Meyrowitz menagerie – which also boasts three pairs of sunglasses – as others might about their vintage Hermès bag collection or array of Louboutins. 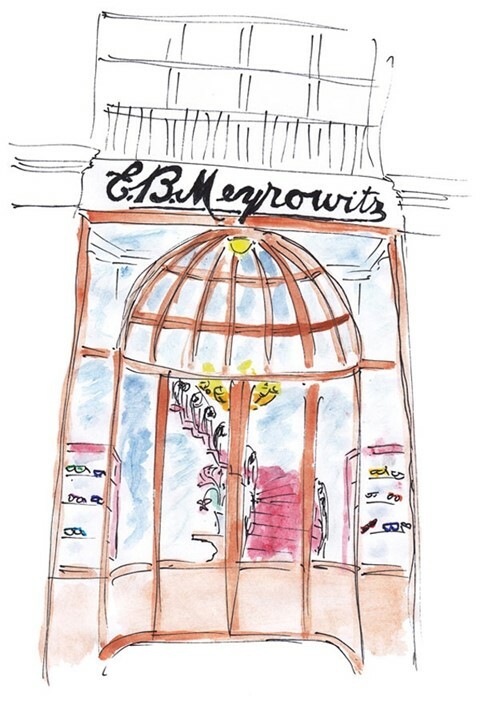 Indeed, the pleasure of being contacted by Meyrowitz and then being handed my brand new spectacles – delivered in the shiny silver case – is like opening Pandora’s box, but only releasing stylish good. "The pleasure of being contacted by Meyrowitz and then being handed my brand new spectacles – delivered in the shiny silver case – is like opening Pandora’s box, but only releasing stylish good." No doubt, my obsession with Meyrowitz stems from a belief that glasses add mystery to a face – yes, I totally disagree with Dorothy Parker on that score – and the fact that Meyrowitz, which began in 1875 and was worn by Grace Kelly, the Duchess of Windsor and Charles Lindbergh when he crossed the Atlantic never disappoints. Their service defines Inner Chic. Meaning that Meyrowitz’s manager Jean-Manuel Fixot and his staff are experts in their field yet remain open-minded and accommodating. Eight years ago – flush with cash – I became determined to wear Jacques Chirac’s reading specs from the mid-70s. Meyrowitz copied the pair, warning that they might be a tad masculine and would serve better as shades. Suffice to say, they were right. Cognac-coloured tinted lenses were swiftly added. Meyrowitz equals my idea of contemporary couture. Natasha Fraser-Cavassoni is a Paris-based British writer who covers fashion and lifestyle as well as being the author of Sam Spiegel – The Biography of A Hollywood Legend, Understanding Chic, an essay from the Paris Was Ours anthology, the soon-to-be released Tino Zervudachi – A Portfolio – as well as the Chanel book, for Assouline's fashion series. Robert Beck is former New Yorker currently based in Paris. Also known as C.J. Rabbitt, he is the author and illustrator of several children's books, including The Tale of Rabbitt in Paradis, Un Lapin à Paris and the soon-to-be-published A Bunny in the Ballet.